Weddings – Custom Design and Print Wedding Invitations and More! Your wedding is a wonderful, major event in your life. Every tiny detail is important! We have had the pleasure of designing and printing materials for dozens of weddings. We custom design entire suites from Save the Dates, Wedding Invitations and Thank You cards through Reception Signage, Place Cards and Programs. Our relationship with our couple is important to us. You expect everything to be perfect. We make it a priority that you're not disappointed! Whether you are looking for a single card invitation or an entire suite, we've got you covered. Each invitation we design is custom to your wants, needs and budget. 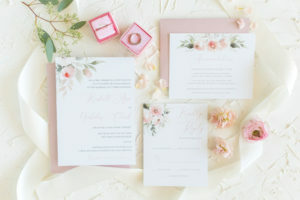 The size and complexity of your wedding will help determine the support pieces that your invitation warrants. Do you have events surrounding the wedding that require responses from your guests? Perhaps you're having a spa day for the ladies, a golf outing for the men, a rehearsal dinner that includes out-of-town guests. Helping you decide how to bring it all together in a beautiful way is where we shine! 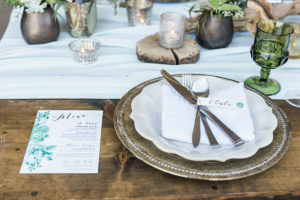 There is so much more to wedding design than invitations. We can help you with the whole process, which of course includes the ceremony and reception. At the ceremony you may need custom signage, decorative prints, and programs. Moving into the reception, we can create one-of-a-kind seating charts, coordinating table numbers, menus, custom guest books, social media cards, favor tags, and just about anything else you can think of to make your big day as perfect as you imagine it to be! Weddings are full of celebrations and we can help with all of the events leading up to your big day. From save-the-dates to bridal shower and bachelorette party invitations, we've got you covered. And, of course, we don't just stop at invitations, we can create unique decor for all of your wedding events. Posters, banners, photo prints, table decor, etc... let us help you make all of your events perfect! © 2016 K Frank Designs. All rights reserved.